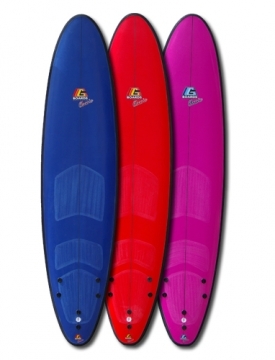 Soft boards are ideal for those just starting out, or those returning to surfing after an extended break! As the name suggests, their soft tops avoid any head injuries, whilst their rubber fins protect you from getting any nasty fin chops. When it comes to G-boards, we at TSA believe the bigger the better, so don’t be surprised if we hand you a 8 foot board- you will thank us when you realise how stable they are, how easily you can paddle into waves, and how quickly you can get to your feet! With this said, the G-board is no performance stick, so expect to progress to a hard board once your confidence has increased after a few lessons.